Workshops help give people confidence to deliver physical activity in their local community. There are training opportunities available for those people who support disabled people of all ages within the community, for example carers, support workers, parents, volunteers and sports coaches. The AK4A Inclusive Community Training (ICT) programme is a 3 hour course that provides people with the skills and knowledge to get people with disabilities physically active. The training is for parents, carers, health workers and volunteers. The training has helped thousands of people across the country become more confident to deliver physical activity to people with a disability. Through the 'Sporting Chances, Sporting Choices' project, Derbyshire Sport have worked with MJM Consultants to develop this workshop. The training is open to anyone who wants to learn more about inclusive sport and how to adapt physical activity to support disabled people to be active. 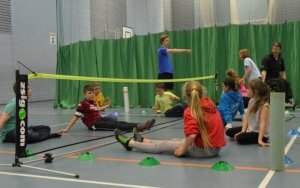 Training can be tailored to specific sports and is open to sports coaches and instructors as well as general volunteers. The training benefited over 100 local people across Derbyshire in 2016, for more information click here.